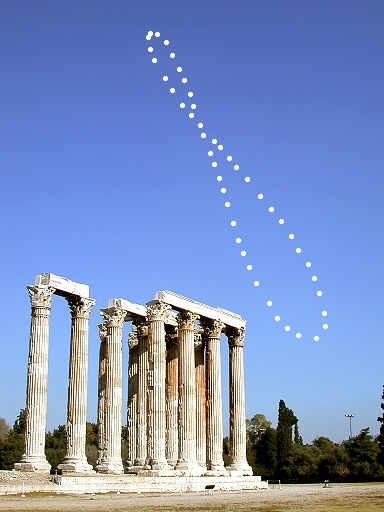 Explanation: An analemma is that figure-8 curve you get when you mark the position of the Sun at the same time each day throughout planet Earth's year. Above, 47 separate exposures (plus one foreground exposure) were recorded on a single piece of film to illustrate this annual cycle of solar motion from March 30, 2003 to March 30, 2004. In the remarkable foreground are standing Corinthian columns of the ancient Temple of Olympian Zeus in Athens, Greece. Solstices, like the one that occurred at 0022 UT on December 22, correspond to the bottom of the figure-8 or the southernmost excursion of the Sun in the sky. The tilt of planet Earth's axis and the variation in speed as it moves around its orbit combine to produce the graceful analemma curve.